Workshops, crafts, games, early science activities, and loads of fun for little firefighters! 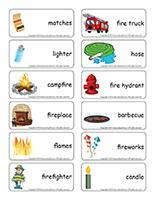 Word flashcards, posters, garlands, activity sheets, coloring pages, puppets, and many more printables for our fire theme. 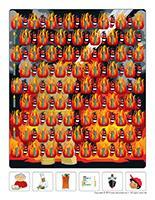 (Open thematic poster-Fire) Print, laminate, and decorate the walls of your daycare with all kinds of posters. 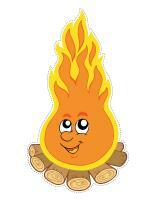 (Open educa-decorate-Fire) Print, laminate, and cut out the various items. Use them to decorate your daycare and set the mood for the theme. (Open garland-Fire) Print the illustrations. Let children decorate them. Cut them out and hang them within your daycare or near your daycare entrance to create a garland. 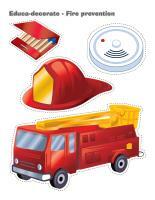 (Open educa-decorate-Fire prevention) Print, laminate, and cut out the various items. Use them to decorate your daycare and set the mood for the theme. (Open educa-decorate-Volcanoes) Print, laminate, and cut out the various items. Use them to decorate your daycare and set the mood for the theme. 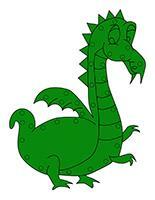 (Open educa-decorate-Dragons) Print, laminate, and cut out the various items. Use them to decorate your daycare and set the mood for the theme. 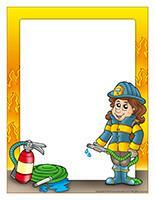 (Open garland-Fire prevention) Print the illustrations. Let children decorate them. Cut them out and hang them within your daycare or near your daycare entrance to create a garland. (Open poster-Fire prevention) Print, laminate, and display on a wall. 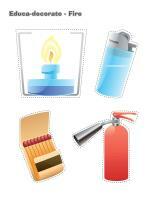 With your group, study the different fire hazards and identify what can be done to avoid accidents. Inform children that it's time for a fire drill. Educ-chat is a game which is made up of several different illustrations which represent subjects, verbs, and objects. They can be used to help children make complete sentences and enrich their vocabulary. (Open educ-chat-Fire) Print, cut out, and laminate the cards. Make three different piles (subjects, verbs, and objects). Ask children to pick three cards, one from each pile. Have them "read" the sentence. The sentences will sometimes be quite silly but you are sure to have fun. You may also choose to place the cards yourself and have children "read" the sentences. (Open picture game-Fire) Use the pictures to decorate your daycare or to spark a conversation with your group. Print, laminate, and store the pictures in a Ziploc bag or in your thematic bin. 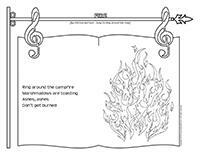 (Open activity sheets-Fire) Print and follow instructions. 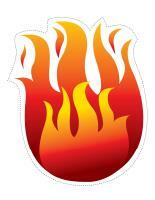 (Open writing activities-F like fire) Print for each child or laminate for use with a dry-erase marker. (Open stationery-Fire) Print. Use the stationery to communicate with parents, in your writing corner, or to identify your thematic bins. All emergency figurines and vehicles (fire truck, ambulance, police, tow truck, etc.). Use an old hose to create roads that can be changed over and over again. Use blocks to build houses. Add figurines and pretend to save them from the flames. Red paper and firefighter helmet model that can be traced. Use 2-litre soft drink bottles to make oxygen bottles for your little firefighters. Use paint or construction paper to represent fire. Old garden hoses or swimming pool noodles for extinguishing pretend fires. Oxygen bottles (2-litre soft drink bottles). Red, yellow, and orange modeling dough. 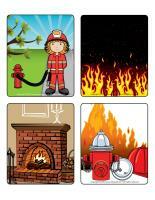 Laminated fire prevention theme picture game. Laminated hot and cold theme picture game. Sequential story illustrating the steps to follow for an evacuation, a fire drill, or if clothing items are on fire. Books about firefighters and related professions (policeman, EMT, etc.). CD of different siren sounds and headphones. Volcano experiment (baking soda and vinegar). (Open scene-Fire) Print, laminate, and cut out the items. Encourage children to use them to decorate the scene. (Open sequential story-Volcanoes) Print and laminate the cards. Children must place them in the correct order. (Open giant word flashcards-Fire) (Open giant word flashcards-Fire prevention) Print, laminate, and display the flashcards on a wall in your circle time area or on a large piece of cardboard that can easily be moved from one area to another within your daycare. Name words and have children point to the corresponding flashcards. (Open game-This is my spot-Fire) Print two copies of each illustration. Use adhesive paper to stick one copy of each illustration on the table. Place the second copy in a bag. Children take turns picking an illustration to determine where they must sit at the table. You may also use the illustrations to determine children's naptime spots or their place in the task train. (Open my fire path) Print, laminate, and secure the illustrations on the floor of your daycare to create a path leading to the areas frequently visited by children throughout the day. The path can lead to the bathroom, the cloakroom, etc. If you prefer, use the illustrations to delimit various areas. (Open game-This is my spot-Fire prevention) Print two copies of each illustration. Use adhesive paper to stick one copy of each illustration on the table. Place the second copy in a bag. Children take turns picking an illustration to determine where they must sit at the table. You may also use the illustrations to determine children's naptime spots or their place in the task train. 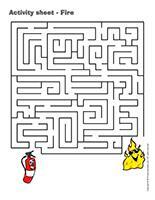 (Open my flame path) Print, laminate, and secure the illustrations on the floor of your daycare to create a path leading to the areas frequently visited by children throughout the day. The path can lead to the bathroom, the cloakroom, etc. If you prefer, use the illustrations to delimit various areas. 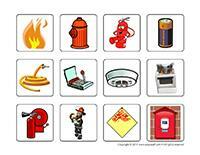 (Open educa-decorate-Fire prevention) Print, cut out, and laminate the items. Use different lengths of fishing wire to hang them from a clothing hanger suspended above your changing table. Provide several red and orange toys to present these colors to little ones. 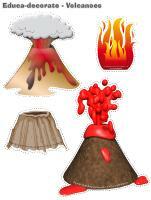 (Open educa-decorate-Volcanoes) Print, cut out, and laminate the items. Use different lengths of fishing wire to hang them from a clothing hanger suspended above your changing table. For this activity, you will need wet facecloths. Deposit a few wet facecloths in the freezer. Wet another series of facecloths with hot water. Give each child one cold facecloth and one hot facecloth. Let them manipulate them. Watch their reactions and verbalize the different sensations for them. Greeting: Invite children to bring an item related to the firefighter profession from home. Circle time: Discuss the firefighter profession with your group. Special activity: Invite a firefighter to visit your daycare. Simply call your local fire station to request a visit. (Open lacing-Fire trucks) Print, trace the shapes on heavy cardboard, and cut them out. Punch holes all the way around each model using a hole-punch. Children will enjoy lacing the shapes with a shoelace or a piece of string. (Open lacing-Volcano) Print, trace the shape on heavy cardboard, and cut it out. Punch holes all the way around the model using a hole-punch. 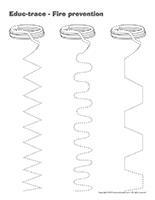 Children will enjoy lacing the shape with a shoelace or a piece of string. (Open lacing-Dragon) Print, trace the shape on heavy cardboard, and cut it out. Punch holes all the way around the model using a hole-punch. Children will enjoy lacing the shape with a shoelace or a piece of string. Firefighters must be in great shape. Set exercise mats on the floor and encourage children to practice somersaults, rolls, jumps, etc. Write simple firefighter actions (climbing a ladder, holding a hose, etc.) on small pieces of paper. Deposit them in a jar. Children take turns picking a piece of paper out of the jar. Whisper the action in their ear and have them mime the action. The other children must guess what their firefighter friend is doing. Have children pretend their clothes are on fire. Teach them to stop, drop, and roll to put the fire out. The firefighters have arrived! Create an obstacle course with the children in your group. You will need a start and finish line. Hang a blanket from the ceiling to represent smoke. Children will have to crawl under it. Arrange exercise mats and swimming pool noodles to create a "ladder" that children must "climb" by jumping over the noodles. Set two buckets of water on the floor. Children will have to transport them to the finish line without spilling water on the floor. Children can complete the obstacle course two at a time. The first firefighter to successfully complete the obstacle course can play again with another child. Teach children what they must do if there is a fire in their home or daycare. Practice crawling and slithering under smoke (a bed sheet hung from the ceiling or held at knee-level). You will need a large cardboard box (appliance box), big enough that all the children in your group can fit inside. As a group, find ways to transform the box to make it look like a fire truck. Collect red objects present in your daycare and deposit them inside your fire truck. This project can last all week long if you wish. (Open dragon's tail) Print and display the dragon on a wall of you daycare. 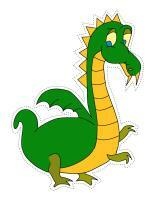 Invite parents to play pin the tail on the dragon with you at the end of the day. Instead of "Simon says...", play "The firefighter says...". Children must follow your instructions only if you say "The firefighter says..." first. Examples of actions: roll around on the floor, climb the ladder, etc. Fill several buckets with water. Children must transport the buckets from one point to another in your yard, moving as fast as they can to extinguish the volcano. There must be water left in the buckets when they reach the volcano! Let children take turns using your hose to extinguish a pretend fire. You can also fill several buckets with water and have them pass them down the chain to encourage teamwork. Use sidewalk chalk to draw flames on asphalt. Provide spray bottles children can use to put out the fire. Children sit in a circle around a pile of firefighter clothing. Play music and have children pass a firefighter helmet around the circle. When the music stops, the child holding the helmet must put one clothing item on. You will need a small drum or a pot with a wooden spoon. Children walk around the daycare. When you tap the drum gently, children hop lightly on the floor. As you tap the drum harder, encourage children to jump higher and faster to represent a volcanic eruption. Variation: You can do this activity with three different drums and associate a different action to each drum. (Open educ-pairs-Fire) Print. Children must color identical illustrations using the same color or draw a line between them. For durable, eco-friendly use, laminate for use with a dry-erase marker. 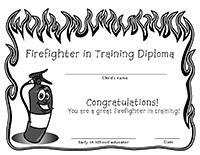 (Open educ-trace-Fire prevention) Print for each child. Children must trace the dotted lines using a crayon of the corresponding color and then color each object using the same color. 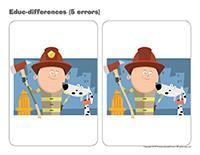 (Open educ-differences-Fire prevention) Print and laminate for durable, eco-friendly use. Children must find the differences between the two pictures and identify them using a dry-erase marker. 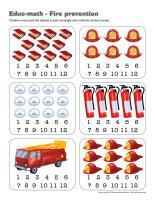 (Open educ-math-Fire prevention) Print and laminate for durable, eco-friendly use. Children must count the items in each rectangle and circle the corresponding number. (Open educ-math-Volcanoes) Print and laminate for durable, eco-friendly use. Children must count the items in each rectangle and circle the corresponding number. (Open bingo-Fire) Print, laminate, and store in a pretty box. Play bingo with your group. (Open educ-intruder-Fire) Print and laminate. Children must identify the six (6) intruders. 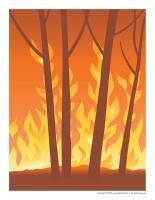 (Open educ-shadows-Fire prevention) Print and laminate for durable, eco-friendly use. 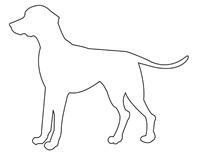 Children must draw a line to the shadow which corresponds to each illustration using a dry-erase marker. (Open color by number-Fire prevention) Print for each child. Children must follow the color code to complete the picture. (Open educ-same and different-Fire) Print and laminate for durable, eco-friendly use. Children must circle the illustration that is different in each row. (Open educ-shadows-Volcanoes) Print and laminate for durable, eco-friendly use. Children must draw a line to the shadow which corresponds to each illustration using a dry-erase marker. (Open educ-ascending-descending-Volcanoes) Encourage children to place each set of illustrations in order, from smallest to biggest. (Open magnetic memory game-Volcanoes) Print two copies. Glue each illustration to the top of a frozen juice can. Attach a magnet to the tip of a fishing rod (a stick with a string tied to one end). Place the illustrations face down on the floor. 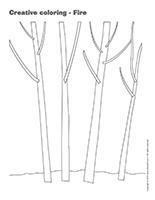 Invite children to take turns picking two illustrations with the fishing rod. If they are identical, he/she may play again. If not, the illustrations must be put back into play and it is the next child's turn. 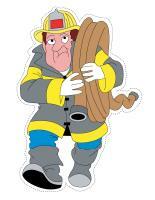 (Open poster-Firefighter of the day) Print and laminate the poster. Throughout the theme, pick one child each day who will get to be the group's firefighter. Let him/her wear a firefighter helmet all day long and give him/her several different privileges. 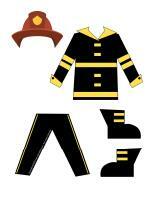 (Open dress-up dolls-Firefighter) Print and laminate. Arrange the pieces on a table and let children dress the paper doll as they wish. (Open illustrations-Fire prevention) Print. You will need two pieces of construction paper, a green one and a red one. The green paper will represent things that are safe while the red one will represent things that are dangerous. Show the illustrations to your group and encourage them to associate them to the correct color. (Open sleeping volcano) Print and laminate. Cut out the two arrows and attach them where indicated with fasteners. Display the sleeping volcano in your quiet corner. 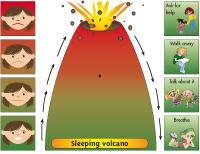 When a child is upset, take him/her to the sleeping volcano to help him/her understand his/her anger. Encourage the child to use the arrows to understand and explain the degree of anger he/she is experiencing. Once children have understood how to use the tool, they will be able to refer to it independently. Ask children which colors can be seen in fire: red, yellow, and orange. Tell children that you are going to paint flames, but that you no longer have orange paint. Give each child a small quantity of red paint and a small quantity of yellow paint and encourage them to mix the colors together. They will be happy to see orange paint appear. Let children try to create orange using markers, coloring pencils, waxed crayons, etc. Fire is beautiful...but very hot! Invite children to sit in a circle. Deposit a lit candle in the centre of the circle. Be sure to set you candleholder in an aluminum plate. Watch and admire the flame. Discuss why touching fire is dangerous with your group. After a while, deposit a glass jar over the candle to extinguish it. Collect several different candles and show children how the heat from the flames melts the wax. Show them how the wax becomes liquid and then hardens again as it cools by letting the wax drip onto a piece of waxed paper. Of course, all manipulations must be done by the early childhood educator to avoid burns. Provide homemade modeling dough and ask each child to build a volcano. Younger children may require your help. When they are done, give each child 1 teaspoon of baking soda and 1 cup of white vinegar (you can use food coloring to dye it orange or red). Have children deposit the baking soda inside their volcano's cavity. When you give them the signal, have them pour the vinegar on top. They will love to watch their volcano erupt. Variation: You may also choose to build one giant volcano. The eruption will be quite spectacular! Fill a sensory bin with pieces of paper, cardboard, fabric, etc. in different shades of yellow, orange, and red. Encourage children to manipulate, tear, and crumple the different materials. Deposit a platter filled with colourful fruit cut into different shapes. Children pick the pieces they prefer and use them to build firefighter helmets, a fire truck, a hose, etc. Take pictures of their creations before they are gobbled up. Print and display the pictures for everyone to see. Give each child a bowl of chocolate pudding. Have them press an upside down ice cream cone (pointy tip up) in the centre of the pudding. Provide orange and red cake frosting they can use to coat the cone to represent an erupting volcano. Prepare red and orange Jell-O with your group. Cut it into cubes and let children arrange them on a plate to represent a campfire. Children will enjoy extinguishing the fire with a can of whipped cream. Cut a square slice of bread in two. Cut one of the halves in two. You will have one rectangle and two squares. The rectangle will become the body of your fire truck. Arrange one square at the front of your truck to represent the motor and the other square on top to represent the cabin. Combine cream cheese with red food coloring and use this mixture to completely coat the fire truck. Add two Ritz crackers that will act as wheels and use pretzels to create a ladder. Finally, add a red jellybean on top (flashing light). Use grated carrots (cabbage or celery root work fine too) to represent fire. Add raisins and mayonnaise and serve as a snack. Slice the dough without unrolling it. Deposit the pieces in a 9 inch x 13 inch oven-safe glass baking dish. Mix the cream and brown sugar together. Pour mixture over the dough rounds. Bake in a 350°F oven for approximately 30 minutes. (Open puppets-Fire) Print the puppet models on heavy cardboard. Invite children to cut them out and decorate them with various materials. Attach a Popsicle stick to the back of each model to create a puppet. (Open puppets-Firefighter) Print the puppet models on heavy cardboard. Invite children to cut them out and decorate them with various materials. Attach a Popsicle stick to the back of each model to create a puppet. 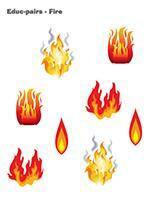 (Open stencils-Fire) Print and cut out the various shapes. Children can use them to trace or paint a variety of items related to the theme. 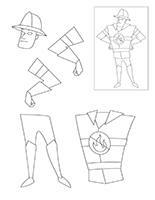 (Open my miniature firefighter) Print, color, and cut out the pieces. Glue them on empty toilet paper rolls to create figurines. Hang them from the ceiling if you wish. Pour a few drops of yellow and red poster paint on a sheet of paper and encourage children to blow through a drinking straw to spread the paint and create pretty flames. You will need the top of an egg carton for each child. Have them paint it red. Cut circles out of black construction paper to represent wheels and glue them on either side of the egg carton lid. Cut a ladder out of the black construction paper. Apply glue all over and sprinkle silver glitter on it. Stick the ladder on the fire truck. Give each child two medium-sized paper plates. Invite children to decorate them as they wish. When they are done, help them staple or stick their plates together using adhesive tape. Ask children to add a red button to complete their smoke detector. Take advantage of this activity to identify the different smoke detectors present within your daycare. Give each child a large cardboard box or divide your group into two teams and give each team one box. Encourage them to create their very own emergency vehicle using poster paint, paper, cardboard, and a variety of recycled materials. Set a piece of paper in the bottom of an empty shoebox. Add three large drops of poster paint (red, yellow, and orange). Deposit a few marbles in the box. Children manipulate the box to paint flames on the paper. At the end of the activity, remove the paper and display your unique painting on a wall. Cut several colourful shapes (squares, circles, rectangles, etc.) out of construction paper and have children use them to create an emergency vehicle. (Open model-Dalmatian) Print for each child. Explain to your group that Dalmatians often play the role of a mascot for firefighters. Cut the model out and stick it on red construction paper. Encourage children to use a stamp or their finger dipped in black paint to add the Dalmatian's spots. Count the spots on each Dalmatian with children's help. Draw a volcano crater on a large piece of white paper. Encourage children to work together to represent an erupting volcano. They can, for example, stick pieces of torn newspaper to represent ashes, glue scraps of red, yellow, and orange paper here and there to represent lava, etc. 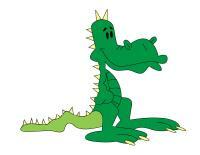 (Open puppets-Mr. Dragon) Print the puppet models on heavy cardboard. Invite children to cut them out and decorate them with various materials. Attach a Popsicle stick to the back of each model to create a puppet. (Open models-Dragons) Print and cut out. Stick the dragon on a piece of construction paper. Ask children to use red, orange, and yellow poster paint to paint fire coming out of the dragon's mouth. 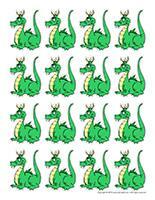 (Open my little dragon) Print, color, and cut out the pieces. Glue them on empty toilet paper rolls to create figurines. Hang them from the ceiling if you wish. (Open moving dragon) Print for each child. Have children color and cut out the different pieces. Help them assemble their dragon using fasteners. Cut ears, eyes, a mouth, and a long tongue out of colourful construction paper. Encourage children to glue them on a brown paper bag to create a puppet. (Open creative coloring-Fire) Print for each child. Encourage children to complete the drawing. (Open complete the drawing-Fire) Print for each child. Children must draw the missing elements. 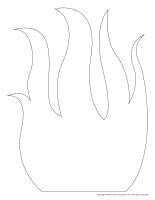 (Open coloring pages theme-Fire) Print for each child.